I work predominantly as a Printmaker, presently engrossed in Silkscreen, combining elements of site specific photography, contemporary ephemera, subverted motifs/metaphors and allegory, lost & found imagery & Drawing. I am continually interested in the self-inflicted demise Mankind faces within our Anthropocene era & our behaviour within it. Although my outlook here is perpetually fearful & pessimistic I try to create a contrary world of destruction, beauty & fatalistic humour, where journey, travel & time, change, metaphysics erasure, air & light, & relationships between things & humanity are all of critical importance. We are delighted to announce our latest course will be arriving at ELP next month. This May we are introducing you to Risograph Printing. This course is ideal for those who are new to the technique or need a refresher! You’ll learn how to operate the Risograph printer yourself by producing your own 2 colour print. Riso is a relatively new printing process that has become increasingly popular in the art and design world over the past few years. Essentially it is a mix between a photocopier and the screen printing process and was designed to allow multiple copies to be quickly produced at a low cost. The course will begin by taking you through the printing process and what the Risograph is capable of producing, and by the end of the course, you will get 15 copies of your final two colour print, as well as a solid understanding of how to use this printing process, create your designs and set up artwork for the Risograph… To find out more and book your place, have a little look at this. 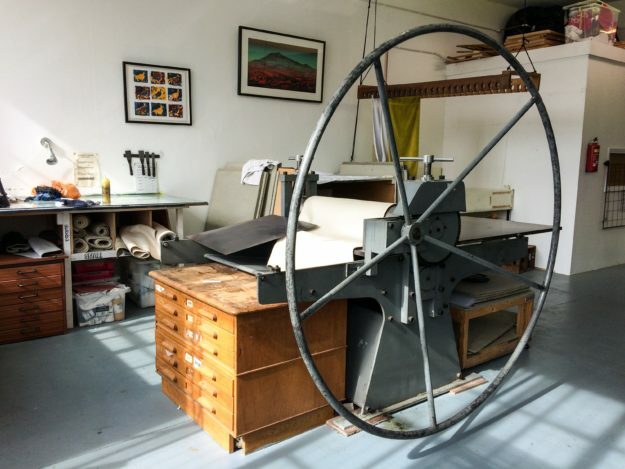 We are very pleased so announce our latest course here at East London Printmakers. This one day, all inclusive course will you give you everything you need to know about turning Screen Printed images on paper, into textile work; 12th April, 10:00- 4:30pm. Although understandably there are many similarities within the practices, there are some crucial tips and techniques that this course will give you in order to create seamless continuity within your screen print practices. This course is perfect for those who already have knowledge and experience within Screen Printing and are looking to expand their existing practice with a new skill set. During the course you will also be reminded of how to coat, expose and strip down your screens, as well as be given the opportunity to mix your own fabric inks and learn about a variety of other binders and their uses on certain types of fabrics. To find out more about the course, and book your place… Have a little look here.